Students practice and expand their vocabularies with these 15 easy-to-play games based on familiar formats like Tic-Tac-Toe and Bingo. Includes step-by-step instructions for small and large-group games. Covers these key vocabulary areas: sight vocabulary for grades 4–6, words with prefixes and suffixes, antonyms and synonyms, idioms, and using context clues to determine word meanings. 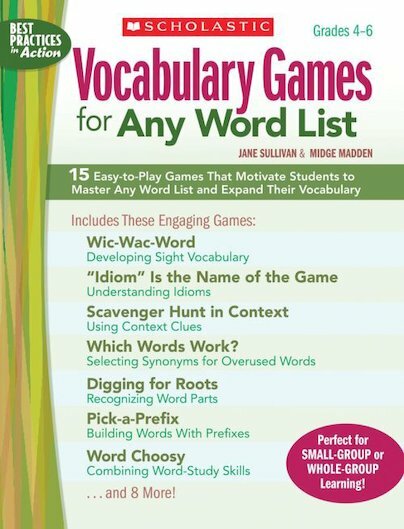 Also includes word-learning strategy tips and word lists by grade level. For use with Grades 4–6.